Hey gang, Valkor here. Here's a case where I got so caught up with something, so deeply immersed with it that I totally forgot that I had to review it! The name Tritton isn't unfamiliar here at TOV as Alacran and I have tackled two of their finest headphones – the AX180 and the AX 720. Since merging with Mad Katz, things have been pretty quiet in that area… until now. 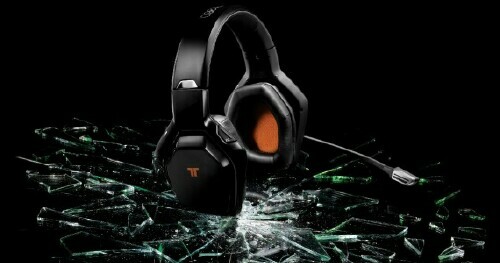 And Tritton has reentered the Val-Cave with their latest gaming headset and they are a BEAST. 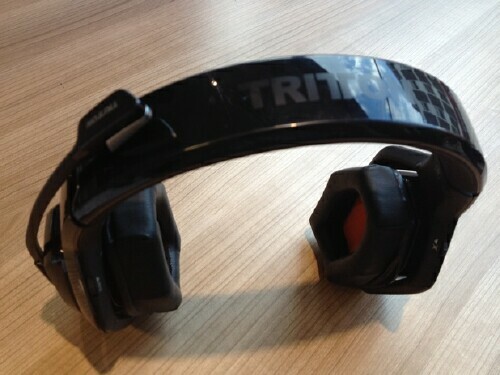 Check it out; it's the Tritton Warhead 7.1 Surround Sound Headset, exclusive and fully licensed for use with Microsoft's Xbox 360. When the box arrived containing the Warhead 7.1, I was I bit surprised and I felt a little overwhelmed by the weight of the package. I thought "this is heavy for no reason, filled with a ton of wires that I need to plug everywhere", much like the AX 180's. But once out of the box, I was quite relieved at a) how light everything was and b) there aren't that many wires to deal with. 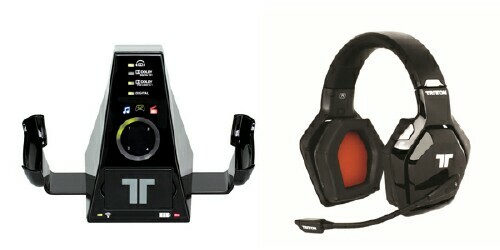 So already Tritton, you're scoring points. The whole set up is covered in a beautiful glossy black finish. Included with the package you get the base station that also acts as a charger, the headset, microphone, audio adapter, RCA cables, AC adapter, Optical cable, international connectors, and two batteries. And what's unique about the base and the headset is the battery cover are magnetized. I like this method as usually any device that uses a clip/snap style door tends to wear or break, depending on how you try to snap the cover back on. In this case, the cover pops in and out of place with ease and held firmly by the magnets. The base of the headset features indicator lights for Dolby Headphones, Dolby Digital EX, Dolby Pro Logic IIx, and digital. Below that is the EQ Mode indicator, which has three modes – gaming, music, and movies. Underneath that is the "Ring of Light", which is used in conjunction with the control pad, and can be set based on what quadrant the controller is set. Just below that is the charging bay (mentioned above). Finally, at the bottom you have the power/sync indicator and the battery charge light. That might be a bit much, but it's all very simple to piece together. At the rear of the base you have the AC power port, a line in port (to be used with older model televisions that might not have the optical port), Optical input, and finally your sync button. Now the headset is a unique piece of work and handles the majority of the work. The ear cups are pretty big and made with soft cushiony faux leather. 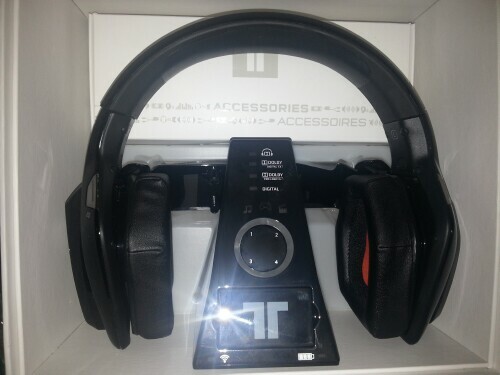 The head band features a soft rubber grip, with the name "Tritton" embossed at the top. On the right cup you have your power button, volume control/mute button, and then there's the EQ mode button to adjust the audio to your preference. The left ear contains the sync button, the SVM/microphone volume control, a port for the detached microphone, and the input button to switch between analog and digital audio. Finally the ear cups can be turned inwards or slightly outward, in case you get tired of all that audio goodness rocking your ears. Setting up the Warhead was a breeze; you need only plug in the optical cable and pop in the power cord. Once it's switched on, you sync it up and then you're ready to play. For this review I'm using a first generation 360 (no red ring of death yet *knock wood*), which requires the use of the audio adapter since this model doesn't have the optical port. 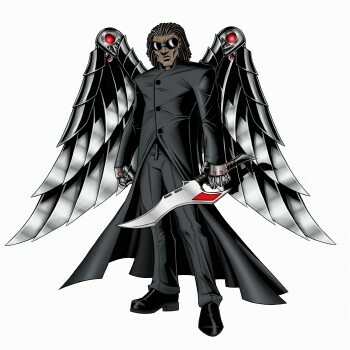 Media used were Castlevania: Lord of Shadows, Akai Katana and one movie DVD – The Avengers. Before we get into the Bang/Slack, I just want to point out a few things: These are official Xbox 360 headphones, meant strictly for use with that console. With that being said, the headphones work equally well with the Playstation 3 and PC through the Optical cord. However, you cannot use the mic. Also, I won't be scoring on the mic function as I don't do online play with the 360. Hell I barely, if at all play online with the PS3 I'm not against it; I'm simply a PS3 fanboy. And with that, on with the TOV Breakdown. While the headsets are lightweight and comfy in the cups, they tend to be a tiny bit too tight. It's not entirely uncomfortable, just a bit too snug. Next there's no power button on the base; It's ok as you can switch off from the headset or it will turn off on its own. I guess I shouldn't really score that in the negative as it's just easier to just power down from the headset. 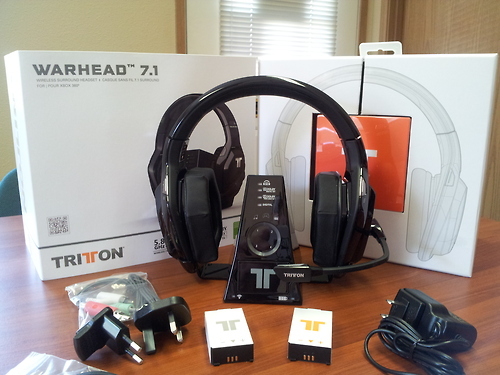 Tritton cuts the cord with the Warhead 7.1 Gaming headset, delivering a stellar wireless surround sound experience. With a comfy fit, gorgeous look, great audio quality, and amazing battery life, the Warhead 7.1 is a solid entry in gaming headsets and rightfully deserves a perfect 5 out of TOV 5 stars. 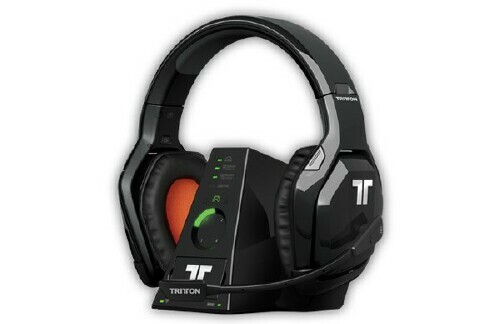 Gamers, specifically you Xbox 360 users, if you're looking to take your gaming to the next level, then Tritton is the way to go. The Slack: A few nitpicks, nothing serious.